Astronomical Observatories of Ukraine is part of the Tentative list of Ukraine in order to qualify for inclusion in the World Heritage List. After a little bit of scouting I discovered that one of these Observatories was located in a leafy part of central Kiev, so decided to head there for a bit of a picnic and a potentially pre-emptive tick on my list of visited sites. From looking at pictures on Google Earth I already knew that there was not going to be a huge amount at the observatory. When we finally arrived we found out there was really not that much to see. We were greeted by a rather large dog and what we took to be a caretaker. He was very friendly and gave us a quick tour of the site, lasting about 10 minutes. There was a rather bemused Ukrainian camera crew there filming us, so who knows maybe I have 'starred' on Ukrainian TV by now. I have to admit that there was not a huge amount for the non specialist to see but some of the instruments and computers in the observatory looked pretty antique, and my friend was impressed by their small selection of Soviet camera's and lenses. 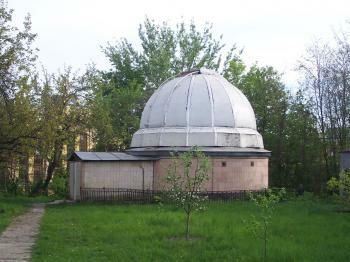 The Observatory was set on the Kiev meridian, however due to light pollution it is now not used that much. I would be surprised if this became a WHS, but maybe the other observatories in the Ukraine are more of interest. If you want to visit this one it is located on Vorovskogo str. right behind the City Park Hotel (take the ramp next to the front of the hotel and this will lead you to the observatory). It actually is a fairly pleasant walk from St Sophia's cathedral and en-route is the excellent IZUMrud, a restaurant specialising in Uzbek-Japanese combinations, you won't find too many of them around. I will be surprised if this one makes the list, unless the other observatories are much more impressive than the one I visited.